Yes, I know I’m supposed to be working on those socks. But the graph is so small and so light, I can barely see it. I’ll have to darken and enlarge it in order to complete those socks. 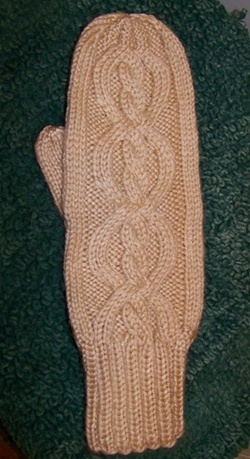 In the meantime, I designed this mitten for a friend. She loves cables. 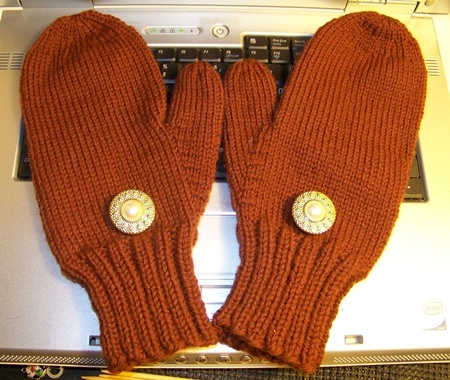 I found a stitch pattern that I liked and did the math to work it into a mitten. Then I had to test knit the pattern, making adjustments as I went along until I reached the final end product. Just finished these. And I promise to start the Bella Mittens next. I did start them with double points but it was awkward. So this time I will use the circular needles as suggested. Anyway, here’s the latest completed pair.